Did we reach our peak last week? Or will eagle numbers rise again? Stay tuned. Visitors and volunteers brave the rain on Highway 530 bridge in Rockport Washington, Satuirday, December 22, 2012, while eagles put on a show below. The sun makes an appearance at Sutter Creek Rest Area (Milepost 100 on State Route 20) on Sunday, December 23, 2012 near Rockport, WA. Eagles were lively on the Skagit River last weekend. Many people braved the rain on Saturday to see the birds pulling salmon carcasses out of the water and feeding on them. When the sun came out on Sunday, suddenly it was eagle bath time. They put their heads and bodies under water and shake all around. Very fun to watch! We’ll be there again the next five weekends, come look through the spotting scope! There are plenty of eagles on the Skagit River right now, but the North Fork of the Nooksack is on fire! Enjoy these photos from EagleWatcher volunteer Don Knutzen. Eagle Watcher Volunteers will be on the Skagit River for the next six weekends beginning this Saturday, December 22. Migrating bald eagles have returned to the upper Skagit to feed on salmon, and US Forest Service volunteers will be there to greet visitors at three places along Highway 20 between Rockport and Marblemount, Washington. Look for the yellow signs. We have binoculars and spotting scopes available for use so you can get an up-close view of the birds. It looks like it will be a wet one, bring raingear and warm clothing. See you on the river. Total: 203 Great start to the counting season. Hoping the chum will hold out until February! Ann inspects a frozen summer Chinook salmon at the hatchery in Marblemount, Washington. Eagle Watcher training Saturday was a blast. Not only did I get to know our excellent new volunteers, I also met rafting guides from Adventure Cascades and Triad River Tours who are joining our great group of permitted outfitters and offering Skagit eagle watching tours for the first time this year. Welcome to the Skagit! Despite the mostly constant rain, the day was very productive. Eagles are definitely here! We had plenty of sightings between Rockport and milepost 100. The river was high enough that there were not many exposed gravel bars. When the level drops, hopefully it will expose plenty of fish. Up at the Marblemount Hatchery, we got a tour from Washington Department of Fish and Wildlife hatchery technician Gary, who showed us some alevin/almost at fry stage chinook in the egg trays and the giant summer Chinook in the freezer. We also crossed paths with Lucy from Skagit Fisheries Enhancement Group and her volunteer tour guides. 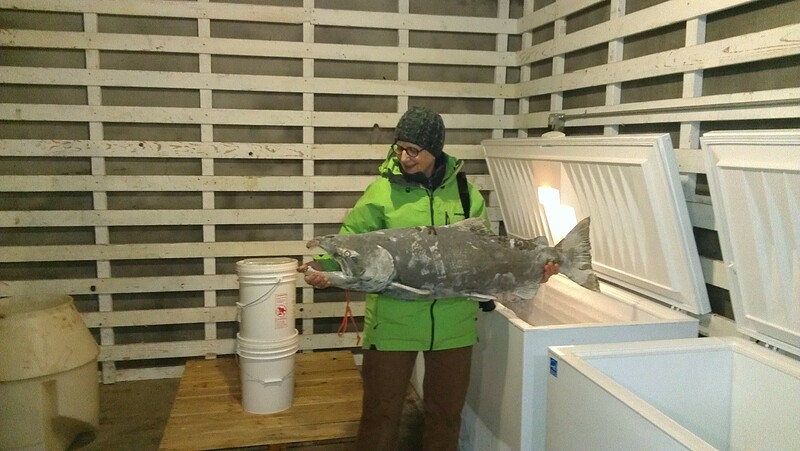 Winter visitors to the hatchery can get a free tour on weekends and will have a chance to see salmon in different stages of development, including the famous freezer denizen pictured above. A rainy walk down Clark Creek trail at the hatchery was amazing. As we stood still along the trail, we saw coho spawning and saw dippers flying underwater and coming up with eggs. Thank you Matt for joining us, and I especially want to thank Steve Glenn for presenting the formal program at the interpretive center in Rockport. I’m looking forward to December 15th when our whole group will be together and Molly Doran of Skagit Land Trust will be our guest speaker. Any time is a great time to go looking for birds on the upper Skagit. The Skagit River Bald Eagle Interpretive Center at Howard Miller Park is open every weekend now, and the Forest Service staffed Eaglewatcher stations open December 22. See you on the river!